Update: the vote was unanimous for parole among the four board/commission members. Each spoke individually. They said their vote was fair and consistent. Update: Looks like OJ will get parole. They have a Florida parole officer explaining the procedures for transfer from Nevada to Florida. 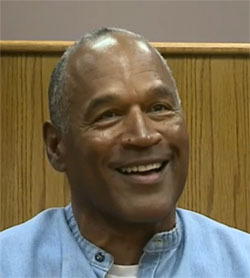 OJ told his version of the robbery he was convicted of during the hearing. It's live on CNN and other channels now. Simpson's current attorney says he will appeal to the Nevada Supreme Court, and if he loses, file a habeas action in federal court. Last week the Nevada Board of Parole held a hearing on O.J. Simpson's request for parole. You can watch the hearing here. The parole board has granted his request, but since on some counts, the sentences were consecutive, he could have to serve up to four more years. OJ's motion for a new trial based on ineffective assistance of counsel is still pending. He also testified he told O.J. not to engage in the plan. "He told me he finally had a lead on some personal pictures and memorabilia that was stolen from him years earlier," Galanter testified. "I said, 'O.J., you've got to call the police.'" O.J. Simpson is in court today, seeking a new trial in his Nevada robbery and kidnapping case. The grounds: ineffective assistance of counsel. His lawyer, Yale Galanter, denies the allegations. Here's Johnny Cochran: "If it doesn't fit, you must acquit...." (4 min. 30 seconds in). Another great line: "They allowed this investigation to be infected by a dishonest and corrupt detective." You can watch OJ try on the gloves here. The Nevada Supreme Court today upheld O.J. Simpson's convictions for armed robbery and kidnapping. The Court reversed the conviction of his co-defendant, saying he should have received a separate trial due to, among other things, the prejudice of being tried with O.J. The opinion is here. When will he be eligible for parole on the 33 year sentence? My best guess, 9 years. The Nevada Supreme Court will hold oral arguments tomorrow on O.J. Simpson's request for bail pending appeal of his 2008 armed robbery conviction. He was sentenced to 9 to 33 years in prison and bail pending appeal was denied. His lawyers appealed. The Court spokesperson says no national networks have requested parking space for satellite trucks at the hearing. O.J. will not be there. If you are interested, the court will be live-casting the argument at 10:00 a.m. PT. It won't be archiving the hearing so you can only watch at that time. The link to watch live will be here. Count 1: 1 year county jail; Count 2: 12 - 48 mos, concurrent with count1; Count 3: 12 - 48 mos concurrent with counts 1 and 2; Count 4: 26 mos to 120 mos; Count 5: 15 years, parole eligibility after 5 yrs, consecutive 12 - 72 mos; Count 6: 15 years, parole eligibility after 5 yrs, consecutive 12 - 72 mos, concurrent with count 5; Count 7: 60 - 180 mos, consecutive 12-72 months; Count 8: 60 - 180 mos, consecutive 12-72 months, concurrent with count 7; Count 9: 18 - 72 mos, consecutive to ct 8; Count 10: 18 - 72 mos, consecutive to ct 9. Update: The judge released jury questionnaires today. Jury questionnaires released Saturday show that five of the 12 jurors disagreed with the 1995 verdict that cleared Simpson of murdering his ex-wife and her friend in Los Angeles. O.J. Simpson is sitting in the Clark County, NV jail today, undoubtedly wondering whether he has any strong grounds for appeal of last night's jury verdict in his Las Vegas robbery/kidnapping trial. Update: O.J. guilty on all counts, live blog of verdict below. The verdict in the O.J. Simpson trial is about to be read. Streaming live site is here or here. It was 13 years ago today that the jury reached a not guilty verdict in his murder trial. I watched the closing arguments this afternoon at The Legal Edge. 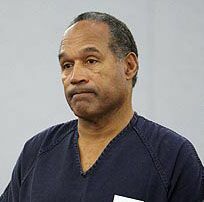 I finished feeling nervous for O.J., thinking he needs a holdout. With the verdict coming in this soon, I'm not optimistic he got one. And yes, I'm rooting for O.J. I'll live-blog the verdict below. "I just want, want C.J. to know that the whole thing all the time he was tellin' me that (bleep), ya know. I hope he was telling me the truth. Don't be trying to change the mother (bleeping) (bleep) now, mother (bleeping) (bleep) holes. I'm tired of this (bleep). Fed up with the mother (bleepers) changing what they told me." A condition of O.J. 's bond is that he not contact witnesses, victims or co-defendants personally or through his agents. O.J. Simpson will be in court in Las Vegas today for the start of his two day preliminary hearing. The case is likely to pivot on Simpson's contention that he didn't ask anyone to bring guns, that he didn't know anyone had guns and that no guns were displayed. Three of Simpson's co-defendants have pleaded guilty or agreed to do so and are expected to testify against him. A preliminary hearing is a hearing at which the Judge decides whether there is probable cause to believe that a crime was committed and that it was committed by the charged defendant. The rules of evidence are relaxed at a prelim, which means hearsay is allowed. Most cases are bound over for trial following a prelim. But don't equate a preliminary hearing with proof of guilt. The standard of "probable cause" is far less than that of "reasonable doubt." In other words, with three defendants cutting deals to testify against O.J., and their credibility not being a big issue at the prelim, you can expect him to be bound over for trial. But, that doesn't mean the prosecution can prove their case beyond a reasonable doubt. I hope everyone will keep an open mind. In the not-suprising news, two of O.J. Simpson's co-defendants have taken deals and will testify against him. Of possible interest is that the co-defendants, Walter Alexander and Charles Cashmore, are pleading to felonies. While I'd expect them not to get jail time in exchange for their testimony, a felony conviction is no walk in the park. It also raises the bar for any plea deal for O.J. I think the prosecution would be hard-pressed to give O.J. a misdemeanor while forcing the others to cop to felonies. Which means, we may see yet another O.J. trial. The preliminary hearing is set for Nov. 8 and 9th. A California Judge has ruled that O.J. Simpson must turn over whatever sports memorabilia he was trying to recover in Las Vegas as well as his Rolex watch to Fred Goldman. According to O.J. 's lawyer, O.J. 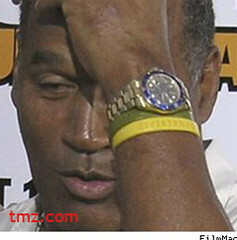 paid $150.00 for the watch, making it likely to be a fake rather than a real Rolex Submariner. Translation: If it turns up on eBay, take a pass. Minor point: No one's answered my question, what if the watch were real and he purchased it with his money from his pension fund which is exempt from the Goldman's judgment? Could he keep it then?